5/8" Matte Vinyl Strap is available in 20 colors by the Roll and by the Pallet. Casual furniture OEMs and refinishers worldwide have used our vinyl strap since 1986. 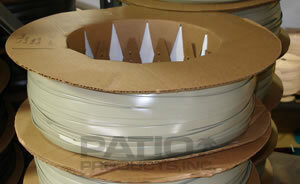 Vinyl strap applications include patio furniture, patio chairs and outdoor furniture. Our vinyl, extruded for outdoor use, is commercial quality 100% virgin vinyl strap with ultra violet inhibitors manufactured into the product. Before you order: you may visit the area to read instructions on getting correct measurements. See cleaning instructions here. Warranty.